An expert in Bangladesh says the global community took too much of time to recognize the reality of the situation. The declaration of the problem as apartheid was a long pending thing. New Delhi (Sputnik) — The state of affairs in Myanmar against the Rohingya Muslims has been declared a case of apartheid by Amnesty International in a report titled 'Caged without a roof'. A Bangladeshi expert says the world took a long time to realize the reality. "The global community is now feeling the pressure of responding. Bangladesh has been at the receiving end of the problem for a decade. The declaration of the problem as apartheid was a long drawn out thing," Bangladeshi senior security expert Major General Abdur Rashid (Retd.) told Sputnik. He added that "such international pressure along with some proactive and honest efforts to restore the lost rights of the refugees by allowing them to return back to their homes is the need of the hour. The efforts made by China in this direction are also praiseworthy." Over 320,000 Rohingya people have fled Myanmar's Rakhine into Bangladesh since late August. They were seeking safety from a military crackdown in Myanmar. Amnesty's declaration of the Myanmar situation as apartheid stems out of a report by it which is the result of a two-year investigation into discrimination against Rohingyas in Myanmar. "Myanmar's policies that restrict ethnic Rohingyas from traveling, visiting a hospital or going to school amount to apartheid," Amnesty International said in the report. The report establishes that Rohingyas have restricted access to education and healthcare in Myanmar. 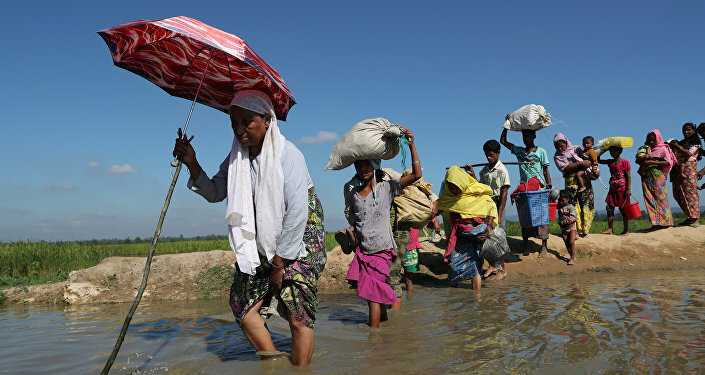 "The Myanmar authorities are keeping Rohingya women, men and children segregated and cowed in a dehumanizing system of apartheid," Amnesty International's senior director for research Anna Neistatv said in a statement. "This system appears designed to make Rohingyas' lives as hopeless and humiliating as possible," she added. The report mentions details of widespread discrimination in Myanmar against the Rohingya Muslim community for a long time and even before the reported cases of violence against them. Recent violence has resulted in around 600,000 Rohingyas presently taking refuge in Bangladesh alone according to official records.